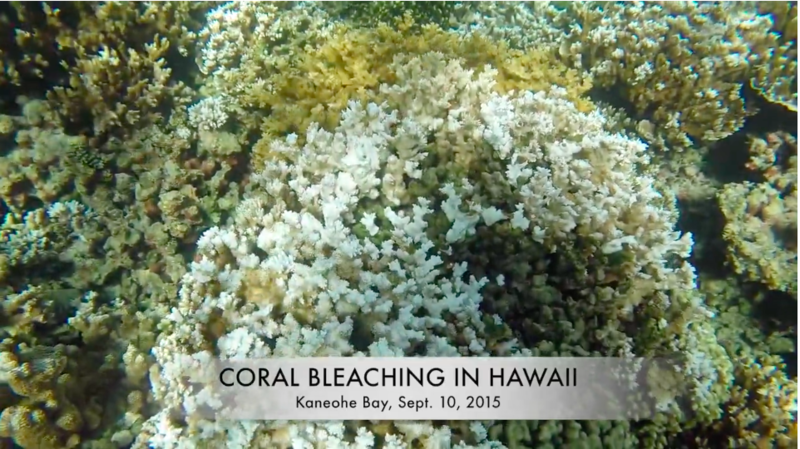 (HONOLULU) – As predicted, coral reefs across Hawaii from Kure Atoll, the northernmost land feature in the Hawaiian Archipelago, to Hawaii Island are starting to feel the effects of coral bleaching. This is a result of coral sensitivity to rises in ocean temperatures as small as 1-2 degrees. Climate experts from the National Oceanic and Atmospheric Administration’s (NOAA) Coral Reef Watch program forecasted severe coral bleaching conditions for Hawaiian waters beginning in August and continuing through October. The warnings indicate that high ocean temperatures compounded by an El Nino event have a strong likelihood of causing mass coral bleaching across Hawaii. Last summer saw the first documented event of mass bleaching across the entire archipelago, and reefs in the Northwestern Hawaiian Islands (NWHI) experienced their third and worst reported mass bleaching event to date. There is concern about corals dying from bleaching because degraded reefs diminish shoreline protection and the availability of habitat for fish and other marine species, which negatively impacts ocean-related businesses and tourism, availability of fish, as well as quality of life for humans. Corals can recover from bleaching, but will die if they bleach for prolonged periods of time. Algae can quickly colonize space opened up when corals die, which slows the recovery of the coral reef. To measure and respond to anticipated coral bleaching effects, DLNR has begun mobilizing monitoring surveys and meeting with partners statewide to devise coordinated response actions. DLNR Chair Suzanne Case encourages people across Hawaii to help reduce stressors and help promote the recovery of reefs. “Being extra careful to not damage corals, preventing pollution inputs, and using pono fishing practices can help corals to recover from this bleaching event” said Case. The state encourages people to report and document coral bleaching to the volunteer Eyes of the Reef Network www.eorhawaii.org, send images of coral bleaching to rrcpcoordinator@gmail.com, and help coral reef ecosystems during these times of high stress.